A couple of months ago a local freelance writer, Kristin Maun, contacted me about doing an article that featured my felted creations and techniques. She came to my home and interviewed me. Then she wrote a wonderful article. 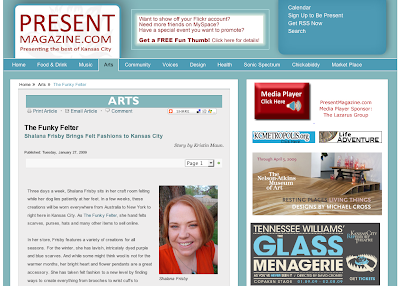 Just this week, I was informed that her article was going to be published in the Arts Section at PresentMagazine.com, a local area Kansas City online publication. I was thrilled to be featured in their latest article about local area artists. A big thanks to Present Magazine and Kristin for their stellar work! Please click here to read the entire article. Very nice article, Shalana. We Etsy folks are proud of you. I'm off to check out your Etsy shop now... I love felted things!